After a few minutes of googleing I found out that his sunglasses are called Drapers and he got them at Old Focals, a vintage eyewear store from Pasadena. 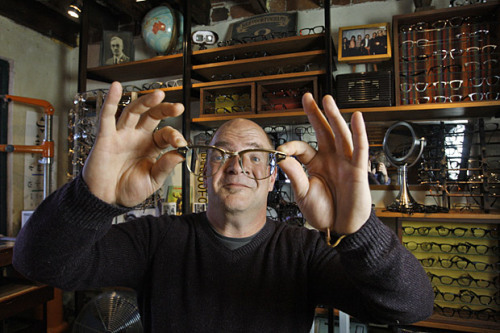 Old Focals founder is Russ Campbell and he’s been supplying eyewear in Hollywood for more than 20 years. I’ve asked Russ to give us insight into Hollywood eyewear business – exclusively for Brands&Films. Russ, I saw Jon Hamm on the cover of Rolling Stone magazine wearing sunglasses. He wore the same sunglasses in the opening episode of Mad Men’ season 6. How did Jon Hamm/Don Draper get those sunglasses? Old Focals has provided the eyewear for Mad Men since it has started. Jon was outfitted for the Rolling Stone cover as his character (Don Draper) and used the sunglasses we provided for the show. Was Janie Bryant (costume designer for Mad Men) involved in the process? No, Janie Bryant is in wardrobe. I work with the prop department. How many weeks/months before the season premiere did the whole process of selecting sunglasses take place? I am sworn to secrecy, but it was some months ago. 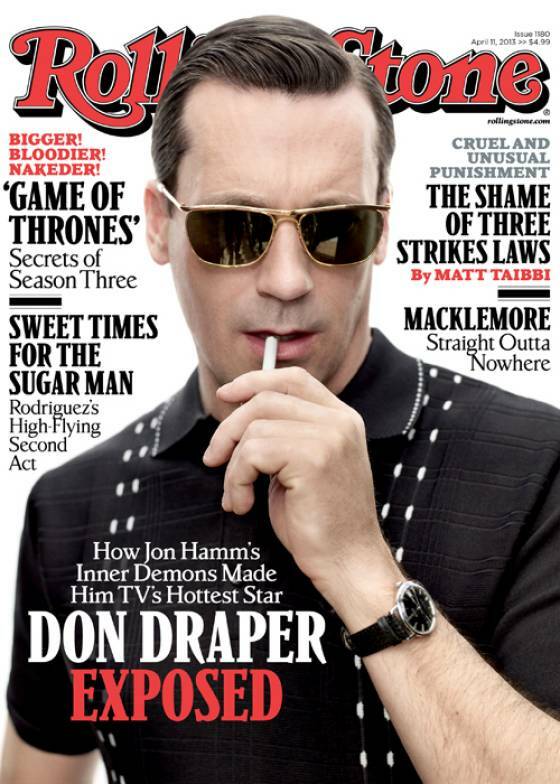 Did you know that Jon Hamm will wear Drapers sunglasses on the cover of Rolling Stone? No, I had no idea. The people at Mad Men were upset that I did not get credit. Are there some other glasses or sunglasses from Old Focals in the Season 6? Yes, every year we change it up. As you can tell, the fashion changes pretty quick in the late 1960’s. On Old Focals’ website we could see that you’ve been cooperating with Mad Men since the beginning. Yes, that’s true and we also received thanks in the end credits. How many glasses have you provided since the first episode? Well, in 6 years a couple hundred each year, so it’s 1,200 give or take. Don’s sunglasses are called Drapers and could be bought in your store and online. How come you decided for a »mass production« of a specific model of sunglasses? Have you done something similar before? I did not produce these glasses. They were purchased years ago and they were sitting in our warehouse waiting to come alive. 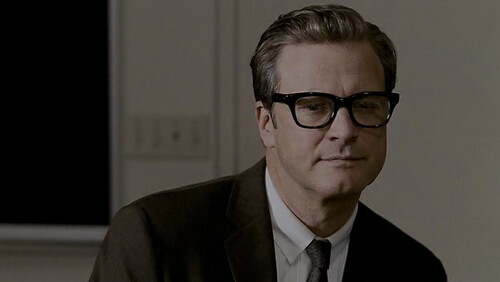 I wrote a couple of blog posts on glasses from Tom Ford’s movie A Single Man. I also read that you were involved in that movie. However, Colin Firth Firth said that he found his glasses in a props box. Did you have a part in that movie? Yes, he found them in a prop box, that I provided to the movie. I worked with my friend and prop master Gay Perrello on that film. At the beginning of every production we fit actors with glasses. I am told who the characters are and we get research and do the fitting. I also wrote a blog post on sunglasses in The Book of Eli. According to available reports Denzel Washington wore Oakley Inmate sunglasses, Mila Kunis wore Mosley Tribes Raynes and Gary Oldman’s glasses were Sama Eyewear’s Club-S. I would say that in case of Denzel and Mila it might be paid product placement, especially since Denzel’s glasses were also on the movie poster, but I saw that you also worked with the production on The Book of Eli. Was there any paid product placement at all? Great question… I have made untold amounts of money for other eyeglass companies over the years (almost 30), but never have I been paid for product placement. How do you get involved in a movie or TV production? Do you get specific instruction from the production team? Do you get very detailed information about the character and his/her role? We work with prop masters. We work together on research. Yes, we talk to the actor,the director, the writer. Sometimes it’s very detailed. Do you only provide glasses/sunglasses or do you get involved in some adjustments on glasses …? We do all things eyewear … If we don’t do it we will find the person that can. How many glasses and sunglasses do you have in your store/warehouse at the moment? Thousands … and thousands and thousands. How do you get all these glasses? Do you explore various markets, travel the world …? I have been collecting for three decades. I would buy glasses all over. Thrift stores, flea markets, and old optical shops you name it. It’s the first thing I do when I travel, to search out hidden treasures. Russ Campbell is the owner and the CEO of Old Focals. He opened is warehouse twenty-six years ago and thirteen years later founded the Old Focals store on West Green Street in Pasadena. The first movie that he provided glasses for was “Tucker: The Man and His Dream” (nominated for three Oscars in 1989). Russ provided glasses and sunglasses for several high-profile movies and TV series: J. Edgar, Tinker Tailor Soldier Spy, The Rum Diary, Cowboys & Aliens, A Single Man, Catch Me if You Can, The Curious Case of Benjamin Button and for Mad Men.